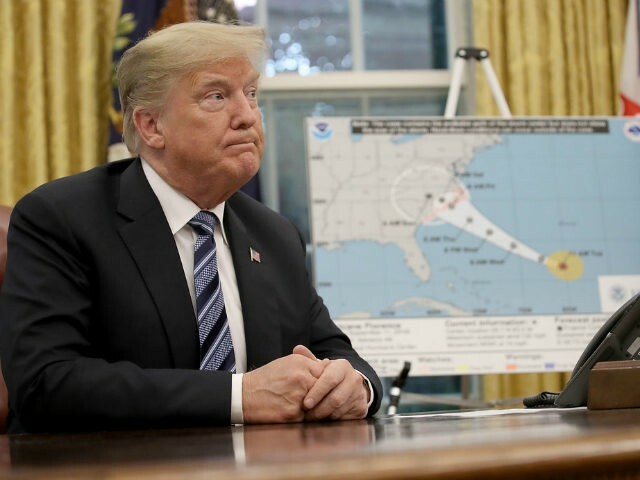 President Donald Trump released a video Wednesday urging Americans in the path of Hurricane Florence to take the storm seriously. Delivering his remarks in the Rose Garden, the president assured Americans that FEMA and first responders were ready for the storm. The Category 4 storm is expected to make landfall on Thursday night on the East Coast. Trump’s video featured an image of the hurricane and the predicted path of its destruction. “We love you all. We want you safe. Get out of the storm’s way. Listen to your local representatives,” he said. He specifically spoke to residents of North Carolina, South Carolina, and Virginia. The president also sent an update on Twitter, warning that the storm was bigger than expected.